This article has been seen 24242 times. 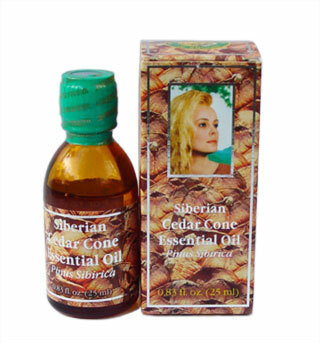 Essential Oil Cedar Cone has a volatile aroma compounds contained in various parts of a plant, mostly in flowers, stems, leaves, fruits and roots. Concentrated liquid extracts of a plant are easily obtained via steam distillation, solvent extraction. Steam distillation is the most popular method for extracting Essential Oils. The plant material is treated with steam until volatile elements of a plant mix with steam particles. This ethereal blend is condensed into water, with the Essential oil floating on its surface. The two substances are then separated. Essential Oils of Essential Oil Cedar Cone have been used throughout time dating back to 4500 BC as perfumes, pleasant aromas and for medical purposes. Nowadays they are gaining a considerable popularity among prophylactic and medical remedies used by alternative medicine. Their pharmacological properties include relaxing effect on nervous system, stimulation of memory and brain work, elimination of emotional stress and hyposomnia and stabilization of blood pressure. It is believed that Basil, Monarda (horsemint), Lavender, Jasmine, Clove and Wormwood oils bring a great benefit to the Immune System. At the same time Lavender extends short-term memory capacity and Wormwood and Rosmarinus (rosemary) improve mental concentration. Such oils as Fennel and Aniseed stimulate lactation. Eucalyptus, Lavender, Aniseed, Peppermint and of Essential Oil Cedar Cone posses antibacterial properties and are used for air disinfection. Using Essential Oil Cedar Cone in massage and inhalation the oil molecules easily absorbed straight into the bloodstream through skin pores or lungs. It increases therapeutic benefit because almost full amount of used oil gets to the aim without losses. However, since most Essential Oils are very concentrated, they are often deluded with carrier oils when applied topically. The carrier oils can be sweet almond oil, apricot kernel oil or cedar nut oil. Carefully cultivated, steam distilled, and always 100% pure, the essential oils in Ringing Cedars of Russia extensive collection are life-enhancing gifts from the plant kingdom, revered for centuries for their restorative properties to body, mind, and spirit. Under Ringing Cedars of Russia’s stewardship, pure essential oils are now re-emerging as a key solution to the challenges facing modern lifestyles. Cleansing, calming, stimulating, and soothing, Ringing Cedars of Russia’s therapeutic-grade essential oils deliver positive benefits to the body as aromatherapy, through massage, and when taken internally. Ringing Cedars of Russia’s line of pure, therapeutic-grade Essential Oil Cedar Cone and unique essential oil blends are sourced from the world's finest plants. They are not diluted with chemical and synthetic additives and are carefully prepared to maintain plant integrity. This commitment to purity makes Ringing Cedars of Russia essential oils the world's highest-quality essential oil line. DIRECT INHALATION: Directly inhale the oil from the bottle. DIFFUSION: Use Essential Oil Diffuser to disperse oil in a micro-fine vapor into the air. HUMIDIFIER: Fill a humidifier with water then place a tissue or cloth, sprinkled with a few drops of oil, in front of the escaping vapor. STEAM: Place a few drops of oil in hot water, cover your head and the container with a towel, and breathe deeply and slowly. DIRECT: Essential oils can be applied directly to the crown of the head, to the temples, behind the ears, over vital organs, to the feet, and on many other locations. Dilution may be required. MASSAGE: Essential oils can be used before, during, and after therapeutic massage. PERFUME: With natural, earthy, and exotic aromas, essential oils can also be worn as perfume. CAPSULE: Add several drops of oil into an empty capsule and swallow with water. WATER OR MILK: Add 1-2 drops of oil to a glass of water or rice milk. BREAD: Add 1-2 drops of oil on a piece of bread. COOKING: Use oils in place of herbs and spices in your everyday cooking. BLUE AGAVE: Add 1-2 drops of essential oil into a teaspoon of Blue Agave sweetener. The cedar was considered to be the Holy Tree of Life among that most ancient civilization, the Sumerians, a mysterious civilization now lost to the ages that gave life to the entire modern world. The bearers of the secret, sacred Knowledge of Sumer believed that the cedar, a symbol of power, greatness, and immortality, was created by God as the storage chest of the energy of the Cosmos on earth. And for that reason it was given the holy right to have its own names depending on its place of growth and its purpose-religious, medicinal, for construction, and even as a standard, a measure of exchange much more valuable than gold. All this is confirmed by clay tablets seven thousand years old found in archeological excavations of the ancient kingdom of Sumer. The head of the Sumerian pantheon, the god Ea, who symbolizes cleansing water, was considered to be the patron of the cedar. Ea was the source of unattainable, hidden wisdom and secret knowledge that he could grant to a worthy person. And the most important thing he gave to people was Life. All precious metals belonged to him, he was considered to be the patron of blacksmiths, trades, culture, art, and science. The Cedar is much the same-together with Ea it personifies beauty (water in the conception of the Sumerians was something majestically beautiful), stability, immortality (some ancient cedars reach an age of 2000 years), health (that is, life), strength, prosperity (the development of culture, the arts, and science), divine pride and grandeur. Demand for the cedar in the Ancient World was so great that the most ancient Epic of Gilgamesh mentions a monster who protected a cedar grove from incursions by outsiders. The tradition of the divine cedar of Sumer was subsequently assimilated by other nations as well. The curative properties of cedars have been known to medicine from the earliest times. Even the Sumerians used extracts, broths of cedar needles, as compresses and poultices. Modern scientific medicine, just as many more ancient teachings regarding health-Eastern, Tibetan, Vedic-confirm the great medicinal properties of the cedar. Literally everything in it-from its green needles to pieces of bark-is of benefit to people and the entire environment. Berries and all plants growing in cedar forests are richer in vitamins and provitamins than those growing in other forests. This can be explained by the fact that the bactericides and fungicides of the cedar actively contribute to the formation in plants and fruits of vitamins and other biologically active substances. Bactericides and fungicides have a beneficial effect on people as well, first and foremost on the nervous and cardiovascular systems, and respiratory organs. The bactericidal and fungicidal properties of the cedar are amazing: the air in a cedar forest is practically free of pathogenic microbes. Over a twenty-four hour period, a hectare of these coniferous giants emits more than 30 kg of airborne organic substances, which have an immense bactericidal strength. In the opinion of researchers, this quantity of bactericides and fungicides is sufficient to render all the pathogenic microbes in a large city harmless. In the interaction of the cedar's bactericides and fungicides with ozone (O3), the ozone molecules are activated, and their energy increases threefold in comparison with a normal molecule of oxygen. Thus, ozonides (O3-), which possess great bactericidal and medicinal properties, are continually formed in the air of cedar forests. In addition, the cedar's bactericides and fungicides increase the air's content of light negative ions, exerting a regulating influence on living cells and tissues, and making harmonious connections with all processes occurring both in the human organism as a whole, as well as each individual cell. Even among ancient medical practices (Eastern, Tibetan, Vedic), natural Siberian cedar essential oil was known as an effective remedy in bronchitis and infections of the urogenital system. The warm, woody resinous aroma of the cedar tree increases the adaptational capabilities of people to changes in the environment-it is recommended to inhale the aroma of the cedar in cases of weather affective disorders, change of climate or time zones. Warming massage to eliminate muscle pains: aromatic mixture-3 drops each of cedar and rosemary essential oils, and 2 drops of eucalyptus essential oil for 20 to 25 ml of cedar nut oil. L. A. Shchennikov, a well-known physician and professor, while striving to grasp the secret of longevity and healing persons from diseases, turned to the Bible, attempting to understand first and foremost the meaning of the letters inscribed therein. His conjectures about the method of regenerating a living cell encoded in the Bible were confirmed and later developed into a discovery. Based on the word post, the Russian word for "fasting," the professor compiled an "Alphabet of Self-Knowledge," deciphering this word as "continuing the movement of the birth force." According to the interpreter proposed by the professor, "cedar" is "the root of the new marvel of birth."